For those folks who are following a grain-free lifestyle- this one's for you (these are also cane sugar-free and dairy-free). Garbanzo beans (chickpeas) form the base of these cookies, which adds a healthy dose of fiber! Make note that these do not set up like a typical cookie, but the flavor is amazing (no, you don't taste the beans). 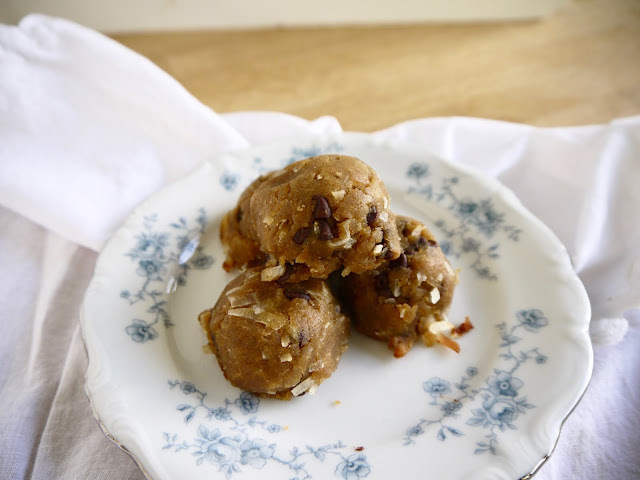 Place garbanzo beans, almond butter, honey, baking powder, and almond extract into a food processor. Puree until smooth. Scoop mixture into a medium bowl. Mix in coconut and dark chocolate chips until well combined. Line two baking sheets with parchment paper or baking mats. Scoop ~ 2 Tbsp balls onto the baking sheet, spreading them a few inches apart. Bake for ~10 minutes, or until set (will still be soft). Transfer to a cooling rack to cool entirely before storing in an airtight container at room temperature (will keep for 5-7 days).